(March 27, 2019 / JNS) The Jewish state has seen remarkable diplomatic success in recent years—from the U.S. recognition of Jerusalem as its official capital last year to Israeli sovereignty over the Golan Heights this week, to emerging relations with countries in Africa, Asia and Latin America. For many observers, Israel has gone from a shunned country to a respected member of the international community. 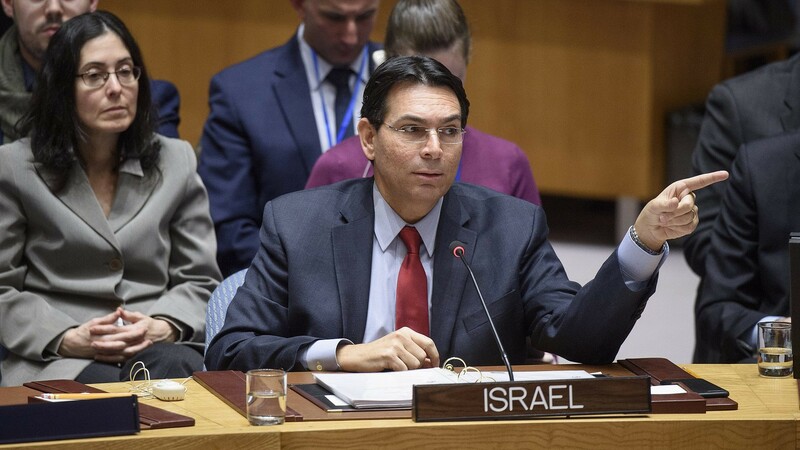 At the center of this success has been Danny Danon, Israel’s ambassador to the United Nations since 2015. Danon has used his prominent position on the world stage in New York to challenge Israel’s enemies, and combat bias and anti-Semitism, while simultaneously using soft power to highlight Israel’s technological, economic, environmental and social achievements as a solution to global problems. A: I think I was able to close the gap between public U.N. to the private U.N. Usually at the U.N., they will speak against Israel publicly, but admire Israel in private. With a lot of hard work and activities, we were able to highlight Israel and Judaism to gain more support publicly. For example, the trip we sponsored taking ambassadors to Poland and Israel. Several ambassadors came, and got to experience Israel and become more educated. And we see this support in votes, I became the first Israeli ever to get elected to chair a U.N. committee, and we got 87 countries to support a resolution against [the terror group] Hamas. For me, it was a great personal achievement, but came from a lot of hard work. Q: Despite your efforts, as well as by partners such as the United States, there remains deep-seated hostility towards Israel at the world body. It was especially on display in Geneva this past week at the U.N. Human Rights Council’s gathering and in its recent report on the Gaza protests. What steps do you plan on taking over the next year to erode such behavior? Q: Israeli Prime Minister Benjamin Netanyahu has invested considerable time over the last few years to develop ties with non-traditional countries in regions such as Africa, Asia and Latin America. Part of this strategy is an effort to bolster support for Israel in international forums such as the United Nations. Are you seeing the fruits of this labor playing out in greater support for Israel? A: Absolutely. It has been a joint effort with the prime minister and me, meeting with many leaders. In all of our meetings, we not only want to see strong bilateral relations, but to transfer this to multilateral relations in the international arena, particularly when it comes to votes at the U.N. or in U.N. organs. You see it all over, countries in Africa or Latin America that used to automatically vote against us—all of the sudden, they are changing their vote, or abstaining or just not showing up. We hope to eventually get them to support us. A: The sooner the ambassador steps in, the better it is—not only for Israel, but for the U.S. and the standing for the U.S. at the U.N. I look forward to working with the new ambassador. We are not worried that there will be any change in policy whatsoever. Sometimes in Israel we have fake news; it wasn’t an accurate report. I decided to stay because it would have been irresponsible for me to leave everything immediately and go back to participate in my party’s primary. I have no doubt I would have been elected in a very high position, but being here, I am aware of the challenges and the things we are dealing with. I decided to complete my term, and I am sure we will have another election in Israel, and I will come back to the government when I finish my term here.